Besides having the traditional Green Bean Casserole at Thanksgiving, I used to overlook green beans when thinking about making a side dish to accompany my main course. Well, that has changed now. These tantalize my taste buds to the extreme. I know… it’s just a vegetable, but in my opinion, these are out of this world. Try ’em for yourself and let me know! In a small bowl, stir together the teriyaki sauce, honey & butter. I prefer to steam the green beans over boiling them as it keeps a lot of the nutrients, but you can do either. In a skillet, heat up sesame seed oil, then saute the bell peppers and onions for 5-10 minutes (or shorter if you like them crispier). Add the beans, cashews and lemon juice. Saute for a couple of minutes, then add the teriyaki-honey sauce and toss gently. Saute on low for another 5-10 min to blend all of the flavors together. As a side note, I paired this with my grilled orange-and-bourbon salmon. ENJOY!!! 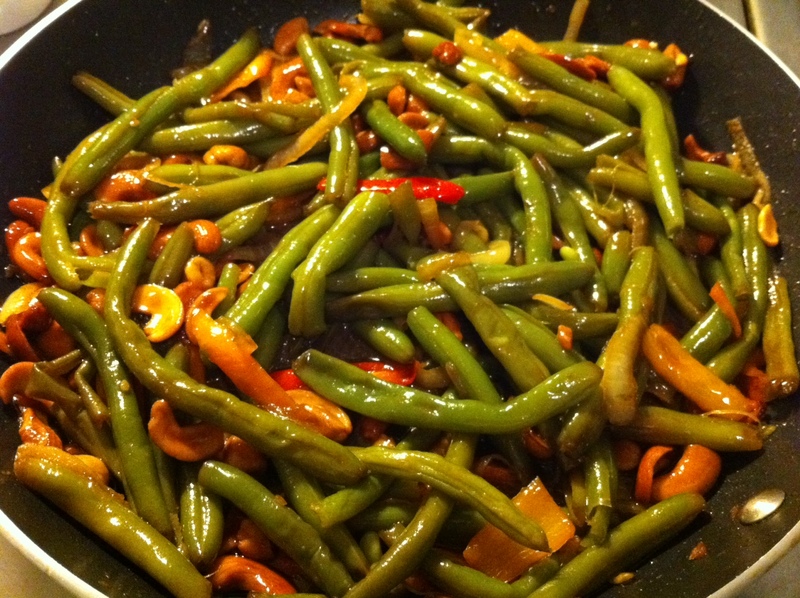 This entry was posted in Recipes, Side Dishes, Vegetarian and tagged green beans, recipes, side dishes. Bookmark the permalink.